In December, the ITC announced it would extend its 30% tax credit until 2019. What are you expecting for SCTY? Get your estimate in here! 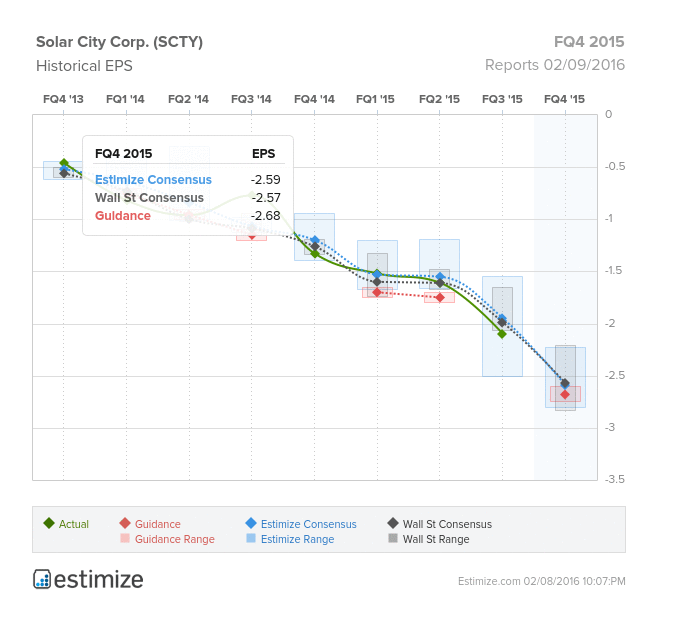 SolarCity Corp. (SCTY) faces tremendous bearish sentiment heading into its fourth quarter earnings February 9, after the market closes. 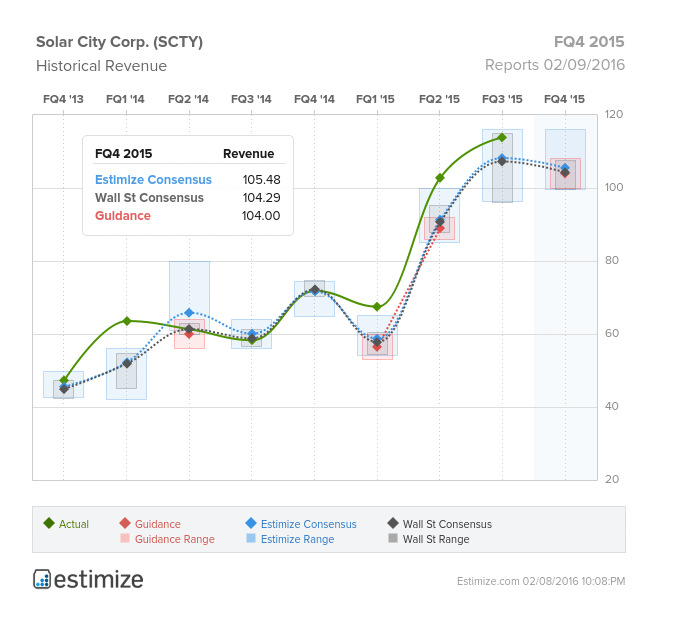 Over the past 8 quarters SolarCity has consistently missed the bottom line with fourth quarter earnings expected to be no different. The Estimize consensus is calling for EPS of -$2.59 and revenue of $105.48 million, consistent with the company’s downward trend. Compared to Q4 2014, this represents a projected YoY decline in EPS of 95% and increase in revenue of 47%.The biggest surprise impacting the company is its shift in strategy consisting of scaling back expansion and investments in growth. This comes as demand slows down and trouble looms with government subsidies and regulations. What was once a budding industry, solar energy has begun to suffer amid uncertain markets. This past December, SolarCity dodged a bullet when the ITC extended its 30% credit level until 2019. This is great news for the industry which heavily benefit from tax credits, making solar economically viable. Unfortunately following the good news, Nevada ended net metering in the state which allows consumers to accumulate daytime energy to use at night. SolarCity since announced it would cease operations in Nevada, which had been the company’s highest growth rate. In a move that will cut 550 jobs, share prices have plummeted 48.4% since the December announcement. Despite projected revenue growth in Q4 the big focus will be on the company’s bottom line as well as its ability to register growth. SolarCity’s anticipated price hike per kWh is now uncertain given the full 30% ITC extension and volatility in the solar energy market. Do you think SCTY can beat estimates? There is still time to get your estimate in here!